Trolley bus in Seattle. Photo by Oran. This comes to mind as it is increasing apparent that Seattle is scripted to lose the electric trolley buses, and neither candidate for Mayor has any intention of building more streetcars. But it’s hard to find any concern about this at Seattle Transit Blog, or any more than the ritual handwringing about the loss of the George Benson Streetcar. In fact, there is a Pollyanna quality to the beliefs that $930 million is available and will be used to implement the surface improvements Nickels was working on. On the Seattle Transit Blog you frequently see discussions and advocacy for more diesel bus service, and many, if not most, would agree that you can’t put a streetcar on a street that already carries too many cars. Even the day-dreaming seldom takes a pleasant turn- I’ve never seen a post about converting the existing electric bus routes to streetcars, and using the buses to electrify new routes. I personally have no opinion on the trolley buses, though I’d argue that not many other media sources have even asked about them. I think it’s great the buses are quiet and green, but I don’t how their costs compare. The Metro audit released this week may contain some answers: it claims that replacing the trolley buses with hybrids when they are up for retirement will save $8.7 million per year. However, it’s feasible that diesel will skyrocket in price sometime in the coming decades — in fact, it would be questionable to assume otherwise. The county shouldn’t rid Seattle of its trolley infrastructure if the trolley buses can be shown to be cheaper when diesel prices are much higher. But what if we need $30 a gallon to make trolley buses more efficient? Given that I don’t know the numbers, it’s hard for me — and other bloggers here — to advocate a strong position on trolley buses. Like the accusation that we’re “Seattle Rail Blog,” this seems to conflate the idea that we have an editorial point of view with the idea that we’re somehow falling down on our (self-appointed) mission. I’m happy to stack up our coverage of any transit mode — light rail, heavy rail, bus, streetcar, even ferry — against other media outlets in the region. We’re wonks and we like it that way. However, a command of the facts doesn’t necessarily lead us to an easy opinion; on the contrary, an understanding of the conflicting issues and interests can often make the right policy woefully unclear. If someone can articulate a convincing position on an issue like trolley buses, then they can use their own platform or they can comment here. Regardless, they should probably make the case without relying on someone else to make their arguments for them. I don’t think that’s really in the context of keeping trolley buses or not. The Metro audit, for example, says we’d save $8.7 million annual by switching to hybrid buses as the trolleys expire. I was unable to find their assumptions for the price of fuel. Regarding that quote: The cost per rider sounds good, but what’s the over-all cost? What is the cost of the loss of roadways as dual-use? Does the report assume that the displaced automobiles, trucks, and other vehicles simply disappear? Does it compare the cost of railed-trolley to ETB? Let me say that I think the bloggers of STB do an incredible job, with frequent posts that regularly attract more comments and better discussion than many nationally known bloggers. This obviously reflects a diverse, qualified, and highly interested readership spending time each day to make it go. At the same time, the success of STB makes it an obvious place to stick the thermometer in. I see a looming disaster in Seattle- what do other people think? Where better to answer that question than reading the posts and comments at STB? Having been raised as a Unitarian, I fully sympathize with the sentiment that “an understanding of the conflicting issues and interests can often make the right policy woefully unclear”- and I mean that literally, as being progressively paralyzed by increasing knowledge is a form of intellectual Guillain-Barre syndrome. Opinions may vary as to the shape of the earth, but almost none of us are afraid we’ll fall off if we go too far west. Naturally, nobody expects a group blog, and even less so the community of commenters, to form a strong opinion about something. In fact, most of our recent experience suggests that may be a really bad idea. That said, my direct references to STB in my post were, indeed, a suggestion that a more active voice might be appropriate. My attempts to understand the coming changes suggest to me that we, the US, may be a lot further behind the curve than we realize. Considering the havoc created by an oil-price spike coupled with ridership increases, isn’t it important to peer more deeply into what’s going on? Well, obviously not, if the readership of a successful blog does not wish to. If it ain’t broke, don’t fix it. Being, myself, very pleased with the opening of LINK and the South Lake Union Streetcar, and being permanently priced out of the Seattle housing market, I have no dog in this fight. Maybe the fairly relaxed approach is the one to take at the moment. And, fortunately, I’m a blogger too. There’s another voice people can read, link to, and comment on if they wish. I did not mean to imply that STB should post on issues of importance to me (although of course they should! ), but that we, at STB, are not commenting very much on issues that I think are important to everyone. As to why I might think that, I guess that’s a good subject for a future post at Orphan Road. I did not mean to imply that STB should post on issues of importance to me (although of course they should! ), but that we, at STB, are not commenting very much on issues that I think are important to everyone. The readers of this blog are self-selecting. It will never be (and from what I gather, has never claimed to be) representative. Let’s not forget that those who most rely on public transportation are likely not to even know this blog exists, much less read it or post regularly. Such is the dilemma of community engagement everywhere, both in the virtual and real worlds. As such, readers will comment on what is important to them. And so yes, there will be holes in the discussions. It’s a blog; not an ongoing transportation survey. i love this blog and think it definitely one of best transit blogs on the web. i would however like to hear more on STB about trolley buses. seattle is lucky enough to have them and they are great unique part of the transit system. the trolleys in seattle are definitely under appreciated and taken for granted IMO. as for the self selecting thats a good thing, you dont want it turning into portland transport blog where every post turns into yet another rail vs. bus debate or where most of the comments start to sound a lot like PI, Times, Oregonian ranting comments. Another quick observation: a highway bus traveling a long distance full of commuters is going to look more efficient in terms of mileage that a “pedestrian accelerator” like most trolley routes. However, they are serving totally different markets. We should fund both, as Metro has been doing. Actually, I’m not sure they do. A highway bus is only full of commuters for one or two trips – then it runs empty. I suspect the trolleys look a lot better in terms of passenger miles per dollar spent. Maybe. I’m also thinking of routes like the 71/72/73 Express, which by definition skip a bunch of stops (and run on the highway when possible). Surely they get “better mileage” than the 70 trolley bus. I’d really like to know what costs were considered on both the ETB side and the Diesel Hybrid side. For example is the maintenance cost of the ETB network inflated by the flawed Breda franken-trolleys? How do ETBs do when you just look at the Gillg coaches? What would the costs look like if Metro had New Flyer make some low-floor articulated ETBs for them to replace the Bredas? Similarly with the Capital costs are the auditors assuming an ETB has a lifetime similar to a diesel coach? I think it is a safe assumption the Gillg coaches will prove to have a similar lifetime to the old AM General ETBs. Were any public benefits such as reduced noise, reduced air pollution, or reduced carbon emissions factored in? It is possible to attach a dollar amount to each of these. Other agencies are spending large amounts of money to reduce noise impacts, air pollution, or carbon emissions. Why is Metro going the other direction? As Martin points out I think we really need to know how expensive diesel has to be for the costs to be the same even under what I assume are the pessimistic assumptions of the auditor about the costs of the ETB network. Specifically, check out the “Technical Report A – Financial & Capital Planning” document, chapter 4, “Alternatives to Trolley Buses”. The document states that annual operating costs were taken from current numbers for KCM for both trolleys ($177k/yr) and hybrid electrics ($141k/yr), so it’s not clear if the trolley numbers are inflated because of older equipment. The savings in operating costs sums up to some $5.6 million, but they additionally identify and $3.1 million that could be saved because of increased scheduling flexibility with non-fixed-wire routes. Finally, they talk both about noise and emissions advantages of the trolleys and the final conclusion of the report with regards to trolleys vs hybrids seems to be “it depends”. “In addition, there may be some benefit of reduced carbon emissions resulting from the use of trolleys.” Some? Umm…like I alluded to: we live in an urban environment; we should be reducing pollution in the city, not increasing it. “The lifecycle cost analysis did not attempt to place a value on the cost of such environmental impacts of electricity generated by hydroelectric plants.” Not a minor oversight in this discussion. A city that uses a large majority of hydro power should be electrifying all major routes. “Charactristics unique to trolleys make these routes difficult to schedule efficiently; for example, trolleys can only travel in limited areas that are under overhead wire, one trolley cannot pass another, and detours to other streets are impossible without wiring.” Oh man, I hate this ‘yay, buses are great cause they are flexible’ argument. They also go on to say how trolleys are available for more federal purchase and maintenance funding, but that is also not included in the cost comparison. Shoddy work if you ask me. > Oh man, I hate this ‘yay, buses are great cause they are flexible’ argument. As a regular rider of the 44, I’ve spent enough time stuck on a bus because of stalled vehicles and downed wires that I’d definitely say there is something to the flexibility argument. Well the next batch of ETBs can be ones that have batteries/super-capacitors to allow them to operate off-wire for short distances. Only really helpful in allowing an ETB to drive back under the wire if off-route for some reason. It was tried many years ago – not with capacitors but with large battery banks. The added utility proved to not be worth the cost and ulimately of limited practical value. Haven’t seen the super capacitor technology applied to trolly buses yet but in light rail vehicles (I think it was Seimans) they were getting a couple of miles on a charge. The big difference from batteries besides weight is the fast recharge. Instead of a network of wires a bus would be able to recharge at stops and run free most of the rest of the route. Less maintenance, less capital cost to install, less resistance from people who don’t visually like a bunch of overhead wires, no getting bunched because you can’t pass. Vancouver and SF trolleys have off-wire capability, either batteries or aux small diesel engines, and that low-tech solution has proven to work well. I believe Boston and Philly have the same; only Dayton and Seattle lack it in North America. Sorry you have had that experience so often. I’d say you should still look at the alternatives. Noise and pollution are known daily nuisances of urbanity while a transit delay due to breakdowns is maybe a few times a year for a single person. Plus, besides a momentary increase in blood pressure (if you are the type), a delay costs you nothing but a tiny fraction of your life. Noise and pollution costs you a lot more. My cents on that. And while there is something to the flexibility argument, there is also something to the opposing argument. As a reader of STB, I’m sure you already know it. I don’t remember off the top of my head what percentage of the operating cost was for fuel. I seem to think it was about 20%? If that’s the case fuel prices would have to double and electricity stay flat for it to be a wash. It also doesn’t account for any differences in capital costs. Fuel prices doubling will undoubtedly happen but if it’s two years or ten years is hard to say. A lot will depend on how much the dollar is devalued in an attempt to pay off the debt. Inflation will hit oil much harder than electricity because so much is imported whereas electricity is largely produced from domestic coal. Electricity can switch it’s mode of generation (nuclear, natural gas, “renewable”, etc.) and diesel is pretty much dependent on crude oil (I don’t see biofuels being much of an answer because any decline in oil is more than offset by an increase in the cost of food). It isn’t just the dollar losing value relative to other currencies but global demand that will drive diesel (and gasoline) prices. As the global economy recovers expect prices to begin shooting up. For that matter they’ve already risen substantially from the low point of the recession. Fuel price inflation risk is something Metro can put a dollar amount on. Airlines and other large fuel users do this all of the time. As I said earlier it is possible to put a dollar value on the reduced noise pollution, reduced air pollution, and reduced carbon emissions of ETBs. While the first two aren’t going to do anything for Metro’s budget they are public costs that need to be considered. In the case of reduced carbon emissions surely Metro can figure out a way to turn these into salable carbon credits or offsets. Finally consider tearing down the wires and dismantling the substations for the OCS is throwing away a fair bit of sunk capital even if you do recover the scrap value of the materials. You aren’t going to have a nice network of wires anymore if fuel prices get truly out of hand. My understanding (don’t have the hard numbers on this) is that the greater costs of maintaining the ETB network has less to do with the maintenance and repair of the buses and more to do with the maintenance and repair of the overhead wire network and associated power equipment, including substations. Many questions I’ve seen on STB about the cost differential seem to focus on the buses without consideration for the infrastructure upon which they depend – a not inconsiderable additional cost. I guess I forget the cost of maintaining the OCS could actually be what causes a majority of the difference vs diesel hybrid coaches. Still given the other benefits of the ETB network, the high risk of severe fuel price inflation, and the already sunk costs in the wire network and power equipment it would seem foolish for Metro to tear down the wires and junk the ETBs. If they do it it will be a decision they will regret in a decade or less. If there is and will be an argument for continuing or even expanding the ETB network, it will be the green/quiet arguments. Cost will as pointed out depend largely on another huge inflationary spike in fuel prices and continued lack of technological advancement. I can however see something like hydrogen-cell fueled or other alternative to wired-electric coming along and making environmental, economical, and practical sense all at once. We can only hope. Get rid of the trolleys — NO! For one the equipment cost is less than a diesel bus — in the last go round the motors were reused from the previous buses and they have to be less expensive to maintain. Also from a rider standpoint they are more comfortable and accelerate better on the hills. Finally they are green — no pollutants other than brake lining, tire parts, and some ozone from the motors. Electric generation does in fact cause some green house gases based on the method of generation — but that’s a stretch as fuel and battery production for the hybrids also does the same. Any one who advocates removal of the trolleys is very myopic indeed. Expand the system and get rid of diesel buses for short – stop intensive runs and save the polluting so called hybrids for longer more express type runs. I’ve seen various studies that were done in other cities (LA for example) that showed that the maintenance costs of ETB vehicles plus wire are lower than that of just diesel buses. Longer vehicle life means lower capital costs in replacing them, and the better acceleration means faster service and thus fewer drivers. And of course there’s the fact that diesel is expensive, while electricity is almost free, especially in the Pacific Northwest. Seattle had an episode of diesel buses roaring up Queen Anne, Marion, and James in the 1970’s when the old singing overhead was replaced. It was not nice. Perhaps hybrids will not roar quite as loudly as did the V-8 700’s assigned to the routes — the only diesels that had the oomph to make it to the top of these 15-18 degree grades. And that of course omits the descent with hydraulic brakes only. It was purest miracle that no bus lost its brakes half way down the Counterbalance during that three year period. However, hybrids also have regenerative braking albeit not as strong as do pure electrics, so that’s less of an issue with them. Since Metro seems to prefer running diesels on flat Rainier, maybe it’s a candidate for complete de-wiring for some cost savings. It’s the longest ETB line and doesn’t share wire with any other except on Jackson. Also, its schedule is frequent enough that were all runs electric the problem of an emptier following bus being unable to pass a fuller leading one would be more severe. However, ETB technology is a major contributor to the refined and quiet lifestyle of the inner-city neighborhoods it serves. Nobody’s talking about dewiring anything – just because some auditors identified it as a possible cost savings doesn’t mean anyone’s considering it. Given what happened with the George Benson Waterfront Streetcar I’m far more skeptical. First they said not to worry a new barn would be built in time to keep the line running. Then they said the temporary service suspension would only be until a new barn was finished. Then they said its only gone for a few years until the viaduct is replaced. Now the powers that be will tell you the Waterfront Streetcar isn’t coming back and if we’re real good we’ll get modern Skoda trams on First Avenue, besides they’re both the same corridor anyway aren’t they? Never mind the Metro website still claims the suspension is only “temporary”. Sounds like those “temporary” suspensions of streetcar service in Boston and Philadelphia. 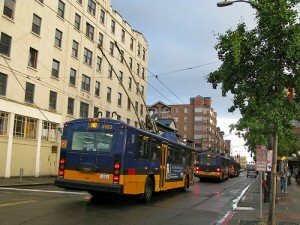 The other issue that electric trolley buses are much quieter than the diesel hybrids. This is a big deal for running buses in neighborhoods. Yes the city is noisy but we don’t have to add to it. As for converting the rubber tired trolleys to steel wheeled trolleys, I’d like to know how the cost pencils out. Steel track does wear out, but probably not as quickly as pavement, but open track is a danger to bicyclists and pavement isn’t. Although the potholes that heavy weight traffic generate are. The opponents to the S.L.U.T. claimed that the street car/trolley was a lot more expensive to run, but I don’t have the link my fingertips. However I’d bet they are right otherwise Metro would be clamoring to install the track as a cost savings. Steel-wheeled trolleys cannot climb the hills on three important TB routes. Queen Anne is called “The Counterbalance” because there is a cable car like pulley buried in the street to which a pair of streetcars used to attach, one on the downhill side and one on the uphill. The weight of the descending car roughly equaled the weight of the ascending one, so the only force the wheels needed to exert was roughly the same as running on level track: to move the car forward and overcome inertia when starting. At the same time, the weight of the ascending car helped to retard the descending one; the brakes did not need to hold the weight of the car, just that of the difference in passenger load. James had a “real” cable car I believe. It would be a huge problem to use the counterbalance today, because the vastly higher traffic volumes around Seattle Center delay the buses. There must be a car attached at both the top and bottom for the system to work. Looks to me like you should throw your scorn on Serial Catowner, who is the poster who made the statement “it is increasing (sic) apparent that Seattle is scripted to lose the electric trolley buses”. Yes James and Yesler had cable cars. I hope we get them back! And that would be really cool to restore the Counterbalance but I know nothing about how that would work. I thought the counterbalance had a large mass running on some kind of track buried underneath the tracks; it would go up against a descending car and go down against an ascender and thus the streetcars didn’t need to time their routes. Did I make that up? Could this technology be re-invented in the modern era without necessitating a brakeman in whose skill the lives of all the riders lie? Governor is on KUOW and basically poo-pooed the entire McGinn position and is committed to the tunnel. Any diversion of funding to transit or other non-road uses is a violation of the state constitution, in her words. She is now addressing the San-Fran comparison of the Embarcadero. Wow. She basically shat on the public vote results “Whats the alternative?” ( her response to an email ). Discussion turning to what could the Mayor do to “monkey-wrench” (Scher’s choice ) the process. My experience with Trolley Buses is that they don’t KNEEL. The trolley buses that run up and down First, Capitol and Queen Anne Hills must stop for quite some time for the lifts which can make a person curse not just the bus, but sometimes (in moments of extreme weakness) the people who need the lifts! Hospitals, retirement homes, condos filled with skiers with broken legs– These are the places these trolley buses serve! Are there trolley buses that kneel? Can we get some? It would depend whether the traction motors could be accommodated within the low-floor design on which kneeling depends. The reality is that ETB’s are one-off purchases whenever they’re bought. There are only six TB systems in North America so there are no North American manufacturers with an “off-the-shelf” TB model. Orders are all custom. Some of the problems with the Breda’s alluded to on this blog may stem from different street standards in Europe. New Flyer has built low-floor trolleys for Vancouver. They’re more-or-less the same coach design as the hybrids. Thanks for the info. Sounds like it’s doable. Actually there are seven or eight systems in North America. Lo siento. Me olvide Mexico. New trolleys in Vancouver, Boston, Philly are low-floor with a/c, off-wire capability, and kneeling design. Would love to see the New Flyer low-floor 40-footer frame converted to ETB. I know of no plans (yet) to actually replace the current ETB fleet, although if they do I would hope that the Bredas are first in line for the cruncher. I have significant respect for serial catowner and Orphan Road, but I disagree that STB readers are ignoring trolleybuses to death or not loving them enough. I’ve loved trolleybuses ever since I first took the 2 to Queen Anne in the 80s and it was almost totally silent and smoother than a diesel bus. (I wish the newer trolleys didn’t have that constant fan noise.) I’m glad Seattle is one of the few North American cities with a trolleybus network, and it has made me not want to live in a city that just had diesel buses. Serial catowner’s complaint seems to be that STB has not published a “Save the ETBs!” editorial yet. I’d say the problem is that the threat is so new and diffuse that there hasn’t been time yet. I didn’t know anybody wanted to kill the ETBs until a few weeks ago; I thought (and still hope) Metro and Seattle are solidly behind them for the reasons stated above (price of diesel, carbon emissions, more pleasant ride, impressive to green tourists). I have heard a few drivers complain that ETBs are more of a nuisance to operate, especially since the poles repeatedly fall off. Are drivers generally anti-ETB? I think STB is more lukewarm about expanding the trolley network (prefering streetcars), but that doesn’t mean people want to see it dismantled. At least not until all trolley routes can be replaced by streetcars, which is a long way off. If there were a more specific threat to ETBs, I think you’d see a more specific response. My post and comment were not meant to be complaints, but observations. I certainly don’t mean to complain about the best all-around transit blog I’ve ever read! And the observation was not meant to be unkind- things are done differently today from how they were in the past, and that could be a real improvement. At the same time, there could be a price to pay, and I’ve seen in the past how these things can happen. In fact, we’ve seen in the recent past how things can happen, with the recent disappearance of the George Benson Streetcar, a disappearance so preposterous I simply didn’t believe it until I saw it. It gave me recovered memories. FWIW, my position on the ETBs is exactly the same as John’s. I’m just not energized about them. If ETBs are more expensive, you have to make the case that they’re so much better than regular buses that it’s worth cutting other buses to get them. Kinda like the streetcar thing, but then the quality of ride on a streetcar is pretty clearly a lot better then a diesel or an ETB. Not really, no. There are a lot of drivers who never spend a day driving trolley buses. More who drive because they are assigned to the duty, but get out of it as soon as they can. Driving trolley buses is more difficult – you are driving two roads, one under the tires and one up in the wires. The switches and special work can be cranky. They are more prone to accidents and supernumary damage incidents due to the nature of the poles and wires. Add to the complexity of driving the trolley buses the fact that all 14 trolley bus routes are in-city, run in heavy traffic bottlenecks, and transport some of the area’s most challenging and diverse passengers – it can be less than desirable duty. However. . .there are a LOT of trolley drivers who get behind that wheel and fall in love with the equipment and the associated challenges of working at Atlantic Base. I am one such, and have encountered many lifer-type drivers who can’t imagine working anywhere else and routinely complain when they have to drive a diesel bus on a weekend or as part of a temporary route assignement. My main concern with the audit that seems to be if not specifically, at least implying, getting rid of the trolleybuses, is that Metro has spent money upgrading the trolley infrastructure. In 2003 they replaced the Central Substation in Downtown Seattle, that was after 60 years in that location. Three Generations of trolleybuses ran in Seattle during that time. Also, the line crews, their base just got rebuilt a few years ago as well. Also, don’t Metro Line crews maintain LINK’s overhead wires as well, since Metro does the Operations and Maintenance? Link has its own overhead maintenance crew. Rail Operations and Vehicle Maintenance are also separate transit divisions in King County. I think the Central Substation work was related to the DSTT retrofit. With all the added trolley wire near Link stations that has appeared (and starts getting used this weekend) it appears that someone in ST and Metro believes there is a future for our trolleybuses. Metro had a phobia about kneeling buses that dates back to the old new flyer fleet and AMG 40 footers which had kneeling but was subsequently disabled. The Gillig bus the trolley fleet is based on has kneeling available – why Metro did not order it is a good question. Metro has included kneeling with all buses since then but should probably encourage more use of it! I rarely see Metro buses knell but Community Transit makes it a habit, sometimes a little bit too much. It seems like every time I’ve seen a New Flyer on the 71/72/73 route stop, it kneels. It’s quite annoying; does that beeping really have to be that loud? I used to get that complaint when I drove a low-floor hybrid. People got downright bitchy about it in fact. Heads-up: there is no volume control on the beeper. Also, I’d rather have a loud beep than an amputated foot – those buses kneel LOW, and if you’re between the bus and the curb – you’re going to lose an appendage. Well you can hear it from a block away. It’s definitely not the driver’s fault, but I’m sure it can’t be that hard to in the future get beeping boxes that aren’t quite as loud. In their presentation to the King County RTC, the auditors said they were not advising in favor of hybrids or against trolley buses as ETBs offer significant social and environmental benefits that should be taken into consideration when selecting a replacement for the existing ETB fleet. I doubt that the ETBs will go anytime soon. I mean, zero emissions, little noise. It may just even be more of an expense to dismantle the overhead than maintain it regularly. And ETB’s never run out of juice. Think of what the future could hold…low-floor trolleys, trolleys with batteries (the closest we have had to off-wire capabilities were the Breda’s diesel engines), who knows? I mean, the city always is trying to address environmental impacts, and replacing an ETB with a hybrid would increase emissons by 100%. Go to YouTube and type in electric trolley bus or search for ETB images on Google. The reality is there are as many trolley fleets out there as diesel fleets. With no engine they actually have more opportunity to be 100% low floor. The Swiss make ETB overhead switches that allow for much higher speeds underneath than the 5-10 mph that Metro requires of drivers. And high speed wire and shoes allow ETBs to max out at 80kmoh, not much under Light Rail’s max speed around 90-95 kmph. The ETBs have always been the step child of the Metro system (ETB elimination is 50-year old subject, not one stemming from an audit report). When diesel was above $3-4/gallon, Diesel buses (especially 40′ since Frankentrolleys are indeed an anomaly) were as expensive as ETB. It is irresponsible of the Auditor to assume that gas prices will track inflation. Cap and Trade or Peak Oil will destroy any economic efficiencies diesel offers transit agencies in the near future. Diesel at $2.99/gallon last time I filled up. does anyone have a quality up to date seattle ETB map? i know theres some old ones here but i was looking for something better. You mean a map of the overhead, kind of like a track map? I traced one of those so it’s higher resolution but isn’t up to date. There’s a trolley overhead layer for GIS but it only shows which streets have overhead and nothing more.